New research-based collection features narratives by top science fiction authors, essays by experts on future possibilities for exploring Mars, Asteroids, Low Earth Orbit, and Exoplanets. Two hundred years after Mary Shelley came up with the vision for the story that would become Frankenstein, Arizona State University, National Novel Writing Month, Chabot Space and Science Center, and Creative Nonfiction magazine will launch a series of writing “dares” to inspire the public to imagine new stories about science, technology and the impact of creation. Renowned futurist, technologist, and author Brian David Johnson, who left his position at the Intel Corporation in January, will be joining Arizona State University as Futurist in Residence for spring 2016 at the Center for Science and the Imagination and as a Professor of Practice in the School for the Future of Innovation in Society. Researchers at Arizona State University have received a four-year, $3 million grant from the National Science Foundation to use the interactive, engaging nature of digital narratives to invite deeper conversations about questions of scientific creativity and responsibility. Just in time for the United Nations’ World Space Week (October 4-10, 2015) comes Journeys through Time and Space, a new anthology of creative, thought-provoking visions of the future shaped by excursions through space and time, and into the labyrinthine caverns of the human mind. 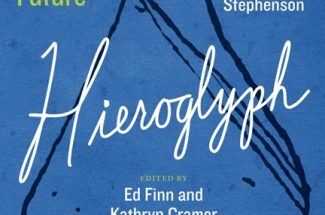 Hieroglyph: Stories and Visions for a Better Future, an anthology of ambitious, technically-grounded science fiction visions of the near future curated by the center, has been honored with an award for Most Significant Futures Work by the Association of Professional Futurists. Imagine a world devoid of animal life except for humans. Or a future where medical advances enable people to live for hundreds upon hundreds of years. Would life be as sweet if there was no end in sight, or without our pets to greet us at the door at the end of a long day? These are just a few of the quandaries explored in “Living Tomorrow,” a new anthology of creative, thought-provoking visions of the future crafted by young people ages 13-25 from across the United States and worldwide. CSI has designed a number of activity stations that are integrated into Phoenix Art Museum’s “Leonardo da Vinci’s Codex Leicester and the Power of Observation” exhibit. The stations encourage visitors to engage in critical and creative thinking and making, and the activities are designed to provide hands-on experiences for visitors to explore a key theme of the exhibit: thinking on paper. Radically new visions of the future will be showcased as part of Arizona State University’s Emerge 2015 – a one-day event featuring visionary Jad Abumrad, host of the award-winning show Radiolab, and 10 spellbinding “visitations from the future,” including theatrical performances, improvisation, games, dance and hands-on opportunities to design and build the future. A panel of researchers from Arizona State University’s Frankenstein Bicentennial Project will deliver public lectures as part of “It’s Alive! : Frankenstein on Film,” a weekend of screenings and conversations, Jan. 23-25, at the SIFF Film Center in Seattle. Arizona State University’s Center for Science and the Imagination and Project Humanities will present the latest installment of the Science Fiction TV Dinner series at 6 p.m., Jan. 22, at the Marston Exploration Theater on ASU’s Tempe campus. The event, focused on the television series Dollhouse, will feature one of its stars, Harry Lennix, whose credits include the films Man of Steel, Ray, The Matrix: Reloaded and Revolutions, and NBC’s new hit series The Blacklist.